A wonderfully fragrant aromatized oil from Umbria’s Frantoio Gradassi. Fresh cloves of garlic are infused with Gradassi’s single-estate extra virgin olive oil. Garnish roasted vegetables, mashed potatoes, pastas and pizza. For many years the Gradassi family has been meticulously cultivating olives on the rocky terrains surrounding the medieval hilltop town of Campello sul Clitunno in the central Italian region of Umbria, known for its abundance in rich vegetation as the "Green Heart of Italy." Following a centuries-old family tradition, the olives are carefully handpicked and then brought to the olive mill on their Estate, which dates back to 1639. 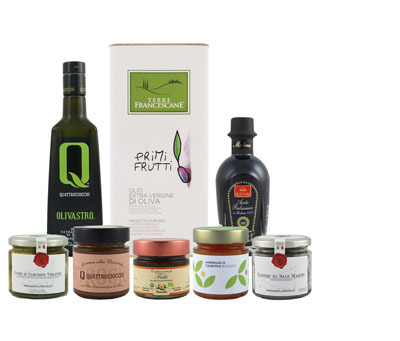 The Gradassi family produces some of the most spectacular extra virgin olive oils in Umbria. Warmth, simplicity, authenticity and an incredible passion for the good things in life is their philosophy.